DECLARATION: This site is dedicated to the service of our Creator, Sustainer and Saviour - The Lord Jesus Christ. Its principal aim is to uphold the supreme Authority of the Judaeo-Christian Scriptures as the one unique body of revealed truth (graciously provided for our eternal well-being) by presenting hard evidence of a self-authenticating principle, closely integrated with the original Hebrew and Greek texts. Such findings defy all naturalistic explanation; consequently, they are endorsed by the commonly-held belief that reason alone is man's only dependable guide. It is a logical consequence of Darwinian thinking that man is not alone in the universe; that other civilizations exist and flourish out there; that among these must be some superior to our own, able and willing to instruct us in the elusive art of peaceful coexistence. Thus it is hardly surprising that we now witness myriads of eyes turned heavenwards in anticipation of some non-random signal emanating from the depths of space that would confirm the existence of such beings. Assuming the fulfilment of these expectations, it is highly likely that regular communication would follow and, in due course, direct contact. Clearly, this is what the ongoing SETI (the "Search for ExtraTerrestial Intelligence") programme is all about. In the initial stages of this scenario, mathematical absolutes - particularly those associated with number and form - are expected to assume fundamental roles. For example, the repeated transmission of a sequence comprising the first thousand or so cubic numbers is highly likely to capture the interest and attention of any intelligent receptor - thereby achieving the immediate purpose of announcing its author's galactic presence. However, in their eagerness to pursue extraterrestial liaisons and find salvation among the stars the world's scientific and intellectual elite appear to have overlooked a similar message closer to home - one expressed in equally persuasive terms. In the following pages it is proposed to correct this oversight by drawing attention to some remarkable phenomena and their potentially far-reaching implications. These are associated, in particular, with the Bible's opening Hebrew words, the Greek form of the name Jesus Christ (understood by Christians to be The Creator), and the riddle of Revelation 13:18. We shall refer to this body of scripturally-based evidence as ALEPH-TAU (the names of the two Hebrew letters which form the central - and untranslatable - word of Genesis 1:1. However, to fully appreciate the implications of A-T it is necessary that we recognise that within the _Book of Number_ per se we find universal constants and a numero-geometric structure representing the confluence of many unique and rare features - both absolute and radix-dependent. We shall call this NUN-RESH (pronounced 'noon-reysh' - the two letters that form the Hebrew word for LAMP). It is the awareness of the existence of N-R, taken together with the observation that A-T maps onto it so precisely, that truly underlines the significance of these findings. The conclusion must be that, as currently read, the Bible is incomplete - its translators having ignored, or otherwise overlooked, the coordinated numerical structures that our Creator has thought fit to include in His word to man. For a concise overview of the findings to date it is recommended that The Beginning of Wonders be read first. Abstract - As was revealed in the author’s earlier paper "The Ultimate Assertion: Evidence of Supernatural Design in the Divine Prologue", the Bible’s opening Hebrew words conceal an ingenious, divinely-devised Cryptogram; we may therefore infer that He who, in the beginning, spoke all things into being simultaneously laid the foundation for a series of symmetrical digital pictures to appear in our day – pictures that would reveal His Being and Sovereignty, confirm the words of Genesis 1:1 and indeed, of the whole of His Word to man. In this paper we pick up the account as viewed from the Bible’s final Book, Revelation. Abstract - The transmission of reliable information from one person to another, from one place to another and from one generation to another has ever been a necessary feature of the human enterprise. Of particular concern to humanity is the status of the Bible in this regard. It has come down to us as a translation of early documents written largely in Hebrew and Greek, declaring itself to be the Inspired Word of God – a claim which hitherto has necessarily been accepted by faith alone. However, there are now good reasons for believing there to be some inherent property of the autographs which – having escaped the attention of generations of translators and others – confirms the Bible to be both self-authenticating and the work of a Supremely-gifted supernatural Author. Abstract - In what many claim to be the Bible's oldest Book, the Lord God asks Job, "Hast thou entered into the treasures of the snow...?" (Job 38:22). Unsurprisingly - the day of magnifying-glass and microscope yet far distant - we gather that Job hadn't, and thereby infer that the question is really directed to future generations of readers - ourselves in particular. 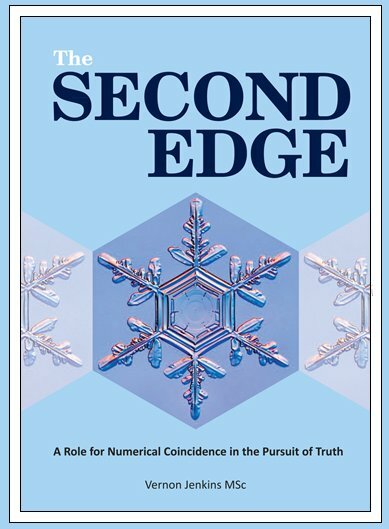 A close examination of the matter reveals that the geometries associated with a snow crystal are also those which determine the numero-geometric structure of the Bible's opening Hebrew words. This strongly suggests that the Judeo-Christian Scriptures are, indeed, inerrant. Abstract - Our Bibles are translations of early documents written largely in Hebrew and Greek. Both languages are alphanumeric, i.e. their letters may be fairly read as numerals, and words as their sums. It is here demonstrated that the seven words of the Hebrew Bible's first verse are far more informative than has previously been supposed. They feature several one-of- a-kind numbers and imposing structures of coordinated numerical geometries; these provide persuasive support for this strategically-placed and powerful assertion, and thereby ratify it, and all that follows. Abstract - This paper repeats and develops a powerful theme featured in the author’s book The Second Edge: A Role for Numerical Coincidence in the Pursuit of Truth, viz. the same numbers that undergird the Bible’s first eight Hebrew words (and from which arise the wealth of integrated geometries) are also to be found in the metric dimensions of an abundant modern artefact – the humble A4 sheet of paper. Remarkably, these same numbers are shown to constitute a coherent set – clustered and replicated without limit throughout integer space. Abstract - According to a prominent spokesman for science on YouTube, the ignorance displayed by the Hebrews of Solomon's day speaks loudly against our believing anything the Bible has to say. This paper presents a considered rebuttal of this charge. The Bible likens itself to a double-edged sword (Ephesians 6:17, Revelation 1:16). We thereby infer that the text proper is supported by some inherent, though undefined, complementary principle. Here is a book which sets out to discover this principle; it is the outcome of some 40 years of investigative effort based largely upon two potentially significant observations, viz. 2. Hebrew and Greek are alphanumeric languages, i.e. their words may be alternatively and fairly read as numbers. Proceeding on this basis we find, in particular, that the fundamental assertion expressed in the Bible's first seven Hebrew words, viz. is copiously marked with symmetrical and coordinated patterns of numerical geometry which speak loudly of supernatural design and purpose. Clearly, the numbers that emanate from these words are divinely-inspired - for Who but our Creator is capable of speaking meaningful words and numbers simultaneously some centuries before the introduction of alphabetic numeration into Hebrew society? They surely confirm the Bible's claim (2Tim.3:16,17) that its words also are divinely-inspired! All who genuinely seek truth may now find it! This all suggests that the current ‘celestial story’ (believed, apparently, by the majority of scientists), with its degradation of man, is no more than an elaborate fairy tale! Clearly, an urgent reappraisal of much of what has been taught as ‘the truth’ in our institutions of education must begin immediately! Abstract - Within the first five quadrillion whole numbers (i.e. 5 followed by fifteen zeros) there are just five which satisfy the absolute criteria, 1) triangularity and, 2) 'star-of-stars' status (i.e. capable of being represented as a 6-pointed star arrangement of smaller, identical, 6-pointed stars). The first of these is 2701 which - because it possesses further interesting attributes not shared by the others - must be regarded as the ultimate and peerless numerical absolute. Therefore to find that 2701 is also the numerical value of the opening verse of the Hebrew Bible is no light matter; there are serious implications! Abstract - These pages summarise those divinely-ordained principles which by sound logical argument establish and reinforce belief in the essential message of the Judeo-Christian Scriptures, viz. the Gospel of Jesus Christ*. The evidence is largely pictorial and principally concerns the first verse of the Hebrew Bible (herein termed The Ultimate Assertion) and the Greek form of our Creator's Name. Currently, there are just four monographs in the series which should be read in the order given, viz. *Stated most concisely: "Christ died for sinners, and you qualify." Abstract - Wikipedia describes the biblical account of creation as 'myth' - in which case, how is one to explain the related evidences of supernatural design embedded in the opening verses of The Book of Genesis and the Gospel of John? A practising doctor of medicine offers his thoughts on one facet of this miracle. Abstract - The application of simple geometric principles to the data provided in Exodus 20:11 enables the construction of a conceptual model of the Creation. This model highlights a number of important relationships - not least, a remarkable confirmation of the data obtained from the reading of the Bible's opening Hebrew words as numbers. Abstract - In a letter to a colleague, dated December 10, 1692, the famous mathematician and scientist Isaac Newton wrote concerning arguments for the existence of God. While (in his view) his principal work, The Principia, offered many good reasons for such belief he nevertheless concludes the letter with the words "There is yet another argument for a Deity which I take to be a very strong one, but till principles on which tis grounded be better received I think it more advisable to let it sleep." Unfortunately, nowhere in his extensive writings do we find an explanation of these intriguing words. Accordingly, our purpose here, is to recreate the missing argument by suggesting a possible train of Newtonian thought. Abstract - The author of the Epistle to the Hebrews advises the Christian that he needs to be spiritually 'weaned' in order to attain maturity in his walk with the Lord (Heb.5:12-14); intriguingly, what he means by 'strong meat' (KJAV) in this context is not made clear, but from the tenor of his words we infer that, secure as he may be in his knowledge and acceptance of the Gospel of Jesus Christ, the believer is likely to find such food unpalatable. Taking this as a lead and basing his argument on clear biblical principles, the author of this essay examines the specific nature of this 'solid food'. Abstract - By adding together the numerical worth of each word (as based on the numeric value of each Hebrew letter) in certain unbroken sequences drawn from the first eight words of Genesis (i.e. the Bible's first verse and following word), one uncovers strong evidence of intelligent design and purpose in the form of a structure of coordinated numerical geometries. Because these words first appeared some millennia before the introduction of alphabetic numeration into Jewish society this structure rests upon a remarkable feat of precognition and mathematical understanding, and is proof that God exists and created the world in the way literally set out here and in subsequent verses. These conclusions are further ratified by the discovery that the same eight numerical values are found echoed in the metric dimensions of an abundant modern artefact - the A4 sheet of cut paper! Militant atheists and all who believe in an evolutionary creation are here invited to provide a naturalistic explanation for the appearance of these phenomena. Failure to do so must spell the demise of darwinism - and of much else! A series of pages which together confirm the highly significant fact that the Bible's opening Hebrew verse is the most remarkable sequence of words ever written - and a standing miracle. Revealing significant numero-geometrical features of the words posted above the Lord's head at his Crucifixion. A neglected commission reveals the Bible to be a self-authenticating text. A series of pages which sets out to explore the thoughts of our Creator while engaged in the design of ETI_F. A series of pages which focus on the numerical geometries attending the opening Hebrew words of the J-C Scriptures. A series of pages which deal with noteworthy features of biblical structure and related matters.